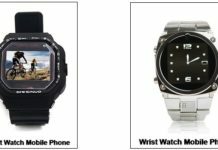 Cell phones certainly have impacted sales of basic wrist watches in past years and many of us don’t bother with wearing one anymore. But that real estate on your wrist is still prime property, and companies are vying for it with renewed interest. I’ve written in the past about the fitness wristbands that are making headway, but with the advent of new technologies, especially the new short range low power Bluetooth standard, other new types of devices have become more viable as well. And the market interest certainly seems to be there. This summer a startup gathered a record $10M in financing on the crowd-financing website KickStart for their Pebble product, basically, a wrist-worn smartphone UI device/watch with an e-ink display (similar to a very small Kindle display). It allows you to do the expected with your Android or Apple smartphone, ie read messages, check for caller ID, control music and so on, but it also has custom apps that will allow for all sort of use cases, including a golf rangefinder app and a bike pedometer. They are promising an open SDK so anyone can build apps for the watch. I worked on a concept like this many years ago and back then the technology was a major limiting factor (a time before Android and iPhones) as microtechnologies didn’t exist to the extent they do today, making it just too bulky. So to me personally it is really exciting to see this product and similar products finally be ready for mass market. Pebble uses Bluetooth to connect, and is highly customizable, including changeable clock faces as well as fitting most wristwatch bands. The display is sharp and readable in direct sunlight, and the battery will last about 7 days and is rechargeable with a USB cable. Currently, they are saying it should be available to ship to the backers in a month or two, and I would expect to see retail sales starting in early 2019. I’m certainly interested to see the final product, a good quality product at the right price would have a lot of market appeal. Sony already has launched a competing product, the Sony SmartWatch. Sony’s product is still a bit bulky to my taste (over 2in square), and the screen is not so sharp especially outside in sunlight. It allows you to display emails and messages, or your Twitter feed with Wireless High-Speed Internet Support. It’s currently only Android compatible, and at $150 it isn’t exactly cheap. Personally, I don’t think it will ever reach mass market appeal, it’s use case is too limited and price and size are not appealing. This category has lots of potentials but I think it is important to the manufacturers to remember that what we consumers wear on our wrists tends to be a direct reflection of who we are, and we value to fashion and style aspects usually above the technical functionality aspects. So the killer product must both look cool and appealing as something we would wear on a daily basis, and function well and be easy to use, and have multiple use cases. I think custom applications are a really critical part of the mix. Combining the right app and cloud service with the processing power of your smartphone can deliver very cool user experiences in the fields of fitness, sports, and health-care as well as shopping and location-based services. Unfortunately, at the moment Sony falls short on most of these factors. Pebble seems to have the better approach but it cannot be evaluated until it really ships. I expect this category of products to be booming come next year, and CES 2019 should showcase some interesting new entries.